Here is a cute Valentine’s Day treat to take to your kids school. It’s a fun twist on the conversation heart candy. I meant for this to have words in frosting on the tops but I did not have the right frosting tip at home when I made them. So, I suggest writing cute phrases on the tops in frosting after you’ve made them. It’s a cute way to make them unique and the kids will have fun reading them. I made chocolate cupcakes and topped them with pound cake dipped in frosting. Yum! You will also need a ziploc bag and 3-inch heart cookie cutter. I found a set of various sized heart shaped cookie cutters at Wal-Mart for a few dollars. Bake Cupcakes as directed on cake mix box. You can use whatever flavor you prefer. I used chocolate. 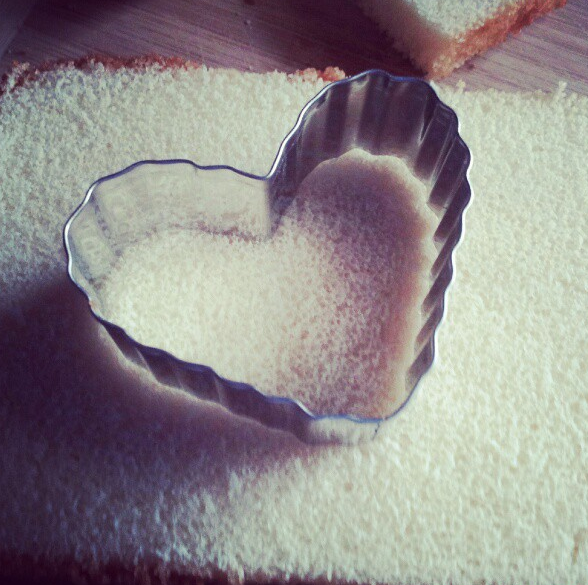 Cut your pound cake in half horizontally and use a 3-inch heart-shape cookie cutter to cut out hearts. Spread vanilla frosting on the top of the cupcakes. 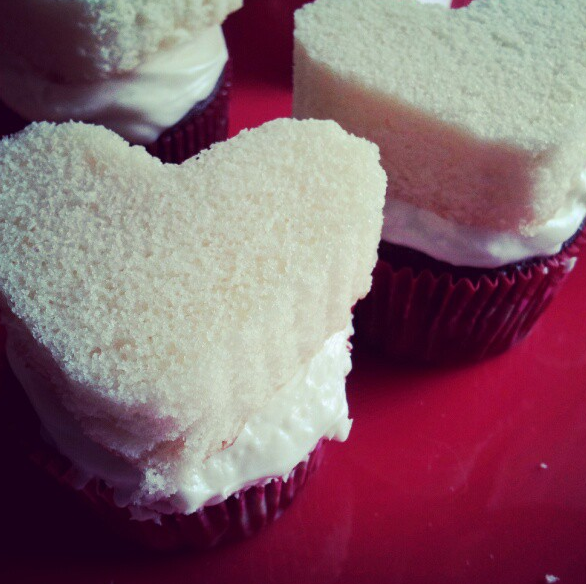 Place one pound cake heart on the top of the frosting on each cupcake. Make sure to press down enough that it does not fall off. Place cupcakes in the freezer for 30 minutes or so. Use one small microwaveable bowl for each color of frosting you will make. Add vanilla frosting. Do these one at a time. I put a couple of large spoonfuls in each and added a tiny drop of the desired food coloring. Stir. Place each one in the microwave for 10-15 seconds. Stir. Take one cupcake out of the freezer and dip into the colored, microwaved frosting. Make sure to cover the pound cake. Let the frosting drip off into your bowl. Set aside. Keep doing each cupcake and colors as you desire. Take remaining vanilla frosting and color with the food coloring you would like to use for your phrases on top of the pound cake. Spoon it into a ziplock bag and use to write the phrases. Do whatever you like. Be creative. Get inspiration from your candy hearts. Place cupcakes on a platter and use the conversation candy hearts as decoration and filler. Sounds like a great treat. Look forward to making some next month! This is a really cute idea…I hadn’t thought about using pound cake, a perfect size for these cute little cakes. I love it, thank you! Very simple to make and I think my grand daughters would enjoy making them with me Cute idea Thanks for sharing! Oh, I have to make these. Easy AND delicious! Omg, these cupcakes look delicious …Really easy recipe also..
What a great idea for a Valentine’s Day party at school or work. I will definitely add a greeting on the top with icing. Thanks for the great idea and recipe! these look delicious and so creative too! This is such a cute idea! I think I will make some this year! Those sounds good – will have to try them! I wish there would have been blogs like this when my kids were little. Great stuff. What a cute idea! I’m sorry I found this after Valentine’s Day. OMG these look so cute and yummy. Wow, that was pretty darn creative, and SUPER easy! Thanks for sharing with us! On the Wilton site I say these with a bear. We have the bear pan, so with your receipe (THANK YOU) we can make this for her class next year. We can use these for a lot of occasions. I didn’t know they would be so easy. Thanks again. So cute and looks so delicious! I’m not very creative when it comes to things like that so I turn to the web for ideas 🙂 Thanks! This is a really neat idea! I’ll have to keep this in mind for next year, but it would also work well for anniversaries. Thanks! My niece &nephew will have fun using the cookie cutter to make the hearts! These look so good, but way sweet at the same time. My daughter would be bouncing off the walls after just one of these. Lol! They look so yummy that I wish I had seen these before Valentines Day, but next year for sure. I am so hooked on cupcakes that I have gained weight and these won’t help me..lol. These are adorable, I’ve bookmarked them for next Valentines. these are so cute! I’d love to make them for church fair! I’m printing & keeping! Easy & fun! these are cute and i bet they taste a whole heck of a lot better than those icky little candy hearts do. now that it is almost st patricks day you could make them in the shape of clovers and color them green. Yum! 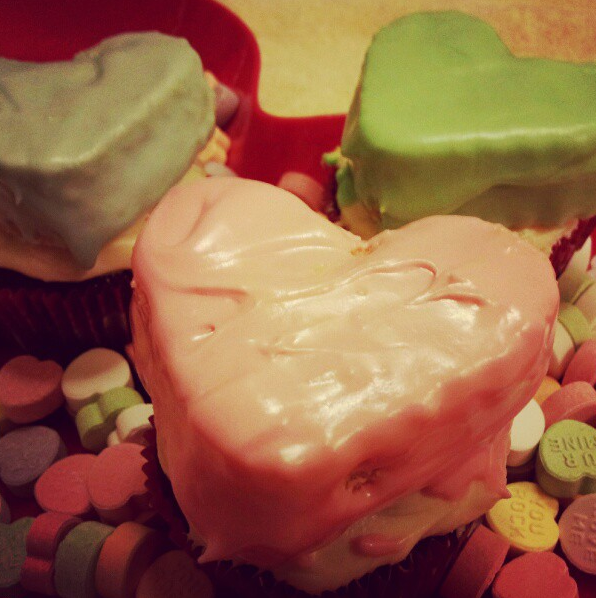 I love cupcakes and conversation hearts – so this recipe sounds like a winner! Oh these are so cute, and it doesn’t have to be valentine’s day to give a heart. I love the fact that if I want a reliable recipe I can just pop in here and get one.These little cupcakes look deliciously tempting to make.I sometimes wonder if you are a chef because your recipes appeal so much to me. How clever! I think these would be perfect for a friend’s engagement party. I’m excited to try this!! Looks Yummy!! Who would have thought of using pound cake…. what a wonderful choice. These are just too cute for words. Going on our must try list. A cute idea and easy! Those are cute and and look tasty too. Everyone brings baked goods but these are a bit more individualized. Super cute idea. I’ll have to remember this for next Valentine’s Day. Those are cute and remind me of the candies. Duh, why didn’t I think of this?! I have a wedding coming up and heart-shape cupcakes would be a neat idea. What a nice easy snack or dessert to make for my grandchildren. They will love it. Great idea and a great “cheat” with the pound cake – I ‘ll have to keep it in mind for other holidays and times I want shapes on cakes, cupcakes, etc. Thanks! What a cute idea! I am going to try these with other shapes too for this summer! Like stars for Fourth of July! Thanks! These look so yummy!!!!! I’m going to have to make these!! Very cute idea!! Can’t wait to make these with my granddaughter!! How cute. Sort of wish my children were still that young to enjoy these. But then again, they are sweet…..my children will still love them. Such a cute idea!! Definitely have to try this out! I love this recipe so much! It’s our 7 year anniversary today so this weekend I will be making this treat. Thanks for sharing because it’s just lovely. At any age a novelty dessert seems to intrigue children, as does the case with my 9 yr old son Evan. Routinely cut hearts in the pancakes that I cook on Sundays – still to this day gets a chuckle out of him and a smile. How sweet… heart pancakes are such a cute idea! These look so cute – this is a great idea for next V-Day! I love cupcakes. That is a nice project that the kids can help with and enjoy. This is beautiful. Perfect for a holiday. wow!! these are too precious!!! Great idea for V-day or a birthday! I love this idea! I make chocolate cupcakes, often and this would be a fun spin to put on them! Double treat! This is so cute! I’ll have to remember this when Feb. rolls around. so cute and looks easy to make! My daughter just got engaged and I will be throwing her a little party for family and friends. I will make these cupcakes and put their names on the frosting, what a neat idea. This is a really cute idea and I personally think they would be ideal for a bridal shower or valentines day.They are just so nice to present to anyone you love. Such a cute Idea! Perfect for Valentine’s Day. Thanks for the Post, Picture’s and the “How To”. These are too cute! Very nice for Valentine’s Day!